What To Learn More About Curacao? On Nov. 11, 2011, the ultimate family cruise vacation will set sail with the anticipated premiere of Columbia Pictures’ newest comedy film “Jack and Jill,” the story of Jack Sadelstein (Adam Sandler), a successful advertising executive who dreads one event each year: the Thanksgiving visit of his identical twin sister Jill (also Adam Sandler). Along with his wife, Erin (played by Katie Holmes) and kids, Jack brings his sister Jill on a holiday cruise vacation aboard Royal Caribbean International’s Allure of the Seas, one of the world’s two largest and most revolutionary cruise ships. Once onboard, a mix of sibling rivalry and Jack’s attempts to set his twin up with Al Pacino (played by himself), who takes a surprising interest in Jill, leads to chaos and calamity. Scenes for the movie, which was written and produced by Adam Sandler and directed by Dennis Dugan, were filmed aboard Allure of the Seas last November during the ship’s pre-inaugural celebrations. Moviegoers just might be inspired to take their own family cruise vacation after watching the activities and antics Jack and Jill participate in while onboard – especially when it results in a surprising bonding experience for the unlikely twins. From enjoying the ship’s variety of restaurants and dining options, to one-upping each other in the pool or during a match of double-dutch, audiences will catch a glimpse of all that a family vacation with Royal Caribbean can offer. By: GlobusAmid the splendor of modern cities it’s hard to imagine what places looked like before they became what we know today. In a previous incarnation, the ground where Buckingham Palace now stands was a mulberry garden cultivated by King James I as food for silkworms. The silk industry he hoped to nurture never materialized, and eventually a roadhouse was built there, followed in due course by the Blake House, Goring House and Arlington House. Originally known as the Buckingham House, built as a townhouse by the Duke of Buckingham in 1709, the estate was acquired by King George III in 1762. After a great deal of growth and expansion transforming a “House” into a “Palace,” the Buckingham estate was first embraced by Queen Victoria, who moved in three weeks after her accession to the throne in 1837, marking the first sovereign to take up residence there. Buckingham Palace has served as the royal residence ever since. Destinations have stories. Bring them to life with Globus. 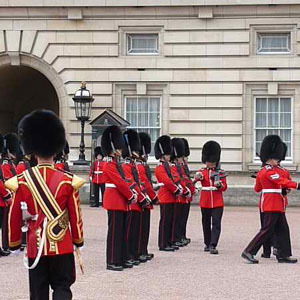 Contact Cruise Innovations and let the Queen’s Guards help you bring your own story to life! Goethe once observed that Tuscany “looks like Italy should.” Fortunately, little has changed in the two centuries since the German poet was himself a tourist in Tuscany. The Tyrrhenian port of Livorno was founded in the 15th century. It is the gateway to Italy’s Tuscan region and to many spectacular sights; including the extraordinary Leaning Tower of Pisa, the charming medieval village of Lucca, the lovely hill town of San Gimignano and the timeless city of Florence. No place is as imbued with such grace, dignity, serenity and history as is Florence. This city’s wealth of architectural and artistic treasures includes works by Raphael, da Vinci, Botticelli and Michelangelo. Truly Florence, cradle of the Italian Renaissance, is one of the world’s most enticing cities. Ponte Vecchio. Florence’s most famous bridge spans the Arno River and is praised for its engineering. Built by the ancient Etruscans, the Ponte Vecchio is Florence’s only bridge to survive World War II. Today, it is a bustling pedestrian bridge of shops and home to the gold and silver guilds. Leaning Tower of Pisa. This famous leaning Campanile or Bell Tower has drawn visitors for centuries. Now inclined 14 feet to one side due to the settling of the subsoil, engineers have been hard at work shoring it up to prevent any further leaning. The top of the tower is said to be where Galileo conducted his famous gravitational experiments. Uffizi Gallery. This popular museum houses the masterpieces by Leonardo Da Vinci, Raphael, and Botticelli, as well as a smaller replica of the David. Michaelangelo’s original David can be found at the Galleria dell ‘Accademia. San Gimignano rises on a hill dominating the Elsa Valley known for its towers. It began its life as a town in the 10th century taking its name from the Holy Bishop of Modena, St. Gimignano, who is said to have saved the village from the barbarian hordes. In 1348 San Gimignano’s population was drastically reduced by the Black Death Plague. The construction of the towers dates back to the 11th and 13th centuries. The architecture of the city was influenced by Pisa, Siena and Florence. Contact Cruise Innovations and start planning your vacation. For a limited-time, guests who are looking to set sail on a once-in-a-lifetime cruise vacation through Europe can receive up to $300 to spend on board (based on stateroom category) on new reservations made on Norwegian Epic by July 31, 2011. MSC Cruises will be putting the accent on pure, fresh and fruity beverages this summer season to ensure the selection of natural drinks, cocktails and fine wines matches the healthier lifestyle choices of increasingly discerning guests. On offer across the company’s fleet of eleven luxurious cruise liners will be a greater range of natural, fresh fruit, lower-calorie and non-alcoholic drinks as well as tantalizing new cocktails that reflect trendsetting adaptations of traditional recipes. “Our passengers are a lot more health conscious and we pride ourselves in keeping up with new trends by continuously upgrading, changing and adjusting our selection of drinks, cocktails and wines to ensure we can always meet their expectations,” said Monica Panero, MSC Italcatering Corporate Bar Management Director. Healthy beverage options are wide ranging throughout the MSC Cruises fleet. All vessels have a Vitamin, tea and Coffee Corner specializing in a large selection of fresh fruit squeezes and shakes. The Musica and Fantasia class ships also feature a Spa Bar dedicated to a range of healthy drinks. The famed MSC Cruises Italian “Gelateria” remains a treasure trove for those preferring non-alcoholic drinks and offer a mouth watering array of ‘smoothies’ prepared with fresh home-made ice cream, milk and seasonal fruits. Sizzling summer season cocktails have similarly been adapted in response to new trends that have moved away from complicated concoctions in favour of a return to the simplicity, elegance and purity of many of the truly great traditional recipes that have stood the test of time. The all time favourite Mojito, with its clean, cool and refreshingly long tasting qualities, remains the best-selling cocktail on all the MSC Cruises liners while a close second is another world famous traditional cocktail, the Piña Colada, which is hard to rival as a sweet frozen drink of rich tropical flavours. In fact two distinct styles of cocktails have evolved for this summer’s menu: the “classique-nouveau” (new classic) and the Famous Brands. The “classique-nouveau” (new classics) offers innovative twists on the traditional classics and feature fresh ingredients and contemporary flavours. The regular Vodka-tini mixed with the trendiest juice on the market has become the fabulous Pomegranate Tini and there are sensational new frozen Mojito’s and velvety Campari Orange shakes. MSC Cruises’ Famous Brand cocktails now rank in a “beautiful people” class of their own. One of the most glamorous is the Martini Gold Dolce & Gabbana from the famed Italian fashion designers who teamed up with Martini’s Vermouth brand to create this alluring aperitif. It is the ultimate in sophistication and involves a refined blend of the purest ‘bergamot from Calabria, lemons from Sicily, oranges from Spain, saffron and myrrh from Ethiopia, ginger from India, and cubebe pepper from Indonesia. Free Specialty Dining, Spa Treatment and More on Royal Caribbean Cruises! Book any 5-Night or longer Caribbean cruise departing August – December 2011 and RECEIVE A COMPLIMENTARY SPA TREATMENT! Book an applicable sailing on either Oasis of the Seas® or Allure of the Seas® and receive COMPLIMENTARY DINNER FOR TWO in a Specialty Restaurant in addition to the spa treatment! Royal Caribbean International and the Nation of Why Not – a place where innovation and imagination reign supreme. From its very beginning, this company has always been guided by the principles of “Why Not?” Why not design a ship specifically to cruise the Caribbean? Why not split it into two to add more features? Why not add rock walls and ice skating rinks and surf simulators? All of those features allow our guests, or should I call them citizens, to ask “Why Not?” in turn – to go out and see, do and be more than they had ever thought possible. To feel that on a Royal Caribbean cruise vacation, they can rediscover who they really are. With more than 280 destinations worldwide and an amazing array of exciting shore excursions and cruisetour options, we’re giving our citizens the chance to try something new – why not go glacier-trekking in Alaska, cave-tubing in Belize, biking through the vineyards of Dubrovnik, Croatia; experience the wonders of China or why not do nothing at all? The choice is yours.